Perspektiva organises a National Forum of Entrepreneurs to enable them to share opinions how they see their future in Belarus. Fountain on Grushevskaya street in Minsk will be restored for the money of locals. The local residents decided to take the matters into their own hands and save the fountain by raising funds for its reconstruction. The Office for European Expertise and Communications (OEEC) invites to a new debate under the series What do Belarusians Think. This time participants will be discussing gender issues. Fifth International Congress of Belarusian Studies. The Congress is to take part on 2-4 October in Kaunas, Lithuania. The preliminary programme is available. The International Congress of Belarusian Studies is an annual meeting of Belarusian and foreign scholars, experts, analysts and representatives of civil society and government institutions, which are involved in studying Belarus. Gender Equality: Why is it Profitable? The Office for European Expertise and Communications (OEEC) invites to a new debate under the series What do Belarusians Think. The new meeting will be devoted to gender issues and take place on 23 September at the Minsk Gallery TUT.BY. 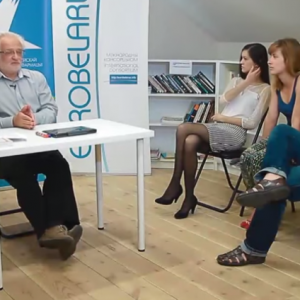 A series of live discussions What do Belarusians Think aim to make the expert debate public and creates a space for discussion of researches on topical issues. Discussions are organised since September 2014 by OEEC in partnership with the Belarusian Research Council, Pact and supported by USAID. Fountain on Grushevskaya street in Minsk will be restored for the money of locals. Since the 1940s, the fountain was the centre of social life of the district, however by the moment it lost its well-maintained appearance. The municipality was going to dismantle the fountain to organise the flower bed instead, but the local residents decided to save the fountain and raise funds for its reconstruction. In total, they need to raise about 170 million rubles. EuroBelarus.info website launches a new video project. The project Postmodern and Anthropotechnique is an attempt to understand the anthropological dimension of era of post modernism and multiculturalism, revolutionary technological and social change, unavailable for people to keep pace with. The first episode of the video project is a series of lectures of the Head of the International Consortium EuroBelarus, Vladimir Mackevich on political technologies of the third generation. Students' Leadership Academy calls for fellows. The Academy implemented by the Centre for Development of Students' Initiatives is designed for active students who are not indifferent to the students’ problems and would like to resolve them. Fellows will be able to select one of the four areas of study: the protection of students' rights, improving the quality of education, belarusization of higher education, student media; or propose their own idea. Gomel Democratic Forum releases a study on media space of Gomel region and a manual on planning and implementing of local media campaigns. Publications are prepared within the framework of a project aimed at promoting best media presence of local CSOs. Now Gomel Democratic Forum plans to continue to support local organisations and initiatives with media consultations. Third Age University in Minsk announces the third call for students. The project aims to educate seniors and implemented by the Belarusian Association of Social Workers. For two years, the University courses in computer literacy, foreign languages, journalism, psychology, local history were attended by over two thousand Minsk residents of 60+ years old. In September, Grodno Golden Age University enrols students for the seventh academic year. Fifth Festival of creativity of people with disabilities was held in Minsk on 13 September. The Festival aims to promote creativity of people with disabilities, establish a comprehensive system of social and cultural rehabilitation of the disabled and their active integration into society. Among organisers were Minsk municipality and non-governmental organisations such as Belarusian Society of Disabled People, Belarusian Association of Assistance to Children and Young People with Disabilities, etc. BISS and CET present a new research on solidarity. On 29 September a research on the potential for solidarity in the Belarusian society is to be presented in Minsk. The study is a continuation and development of the research on the potential for solidarity among CSOs, conducted by the Centre for European Transformation (CET) and the Belarusian Institute for Strategic Studies (BISS) in 2014. The presentation will take place at 6 pm, at the Studio67 venue. New cultural partnership program. The Association of Local Democracy Agencies ALDA (France) together with the International Consortium EuroBelarus announces the launch of the partnership program CHOICE – Cultural Heritage: Opportunity for Improving Civic Engagement. The two-year project is aimed to protect the cultural heritage and strengthening the institutional capacity of cultural CSOs. Presentation of the project will be held on 22 September in the TSEKH venue. XII National competition of school teams about Europe. The contest What I Know about Europe is held annually since 2004, by the initiative group of Belarusian teachers and civic leaders with the support of public organisations. Competition tasks are designed for senior school pupils. The first summer reality-competition of urban projects #RazamMіnsk awarded the winners. Among 11 finalists (selected out of 300 teams) the jury divided the prize fund ($ 1,000) between two projects – Beautification of Pond and Museum of Retro Computers. Minsk residents voted for Clean Business project on separate waste collection. The competition, organised by Onliner.by portal, Talaka.by platform and Velcom mobile company, has brought to Minsk a number of ideas implemented, like installation of bikes spots – facility for free repair bicycles. Belarusian state television continues to convince its audience that voting matters. It also tries to create an impression that it remains an open platform for all candidates. Yet, at the same time state TV clearly promotes one particular candidate while only briefly covering others. However, in regards the election campaign, state TV sometimes allows critical comments such as “The ongoing campaign is boring and uninteresting", or "The state machinery works for just one candidate”. Channel 1 commented on the results of a recent social survey according to which Alexander Lukashenka is highly trusted by Belarusians. All of this and more in this edition of Belarus State TV Digest. The head of state shows his humane face. Journalists of Channel 1 briefly reported on the release of all political prisoners including Mikola Statkievich and Mikola Dziadok. Lukashenka did it because of the “principle of humanism”, they explained. “Dedolarisation” of Belarus. 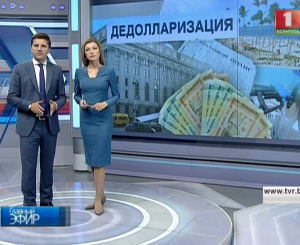 State TV jointly with the Belarusian Ministry of the Economy has launched a project aimed at promoting the concept of paying in Belarusian roubles rather than the US dollar. This will build respect for the national currency, and also strengthen the economy, journalists stated. Why Belarusians go to another country’s war? Channel 1 covered the death of a young Belarusian, Aleś Cherkashchyn, who had recently been killed while fighting in the war in Ukraine. The reporter a few times repeated that the Ukrainian war remained “foreign” to Belarusians, and “Belarusians should not be there”. Channel 1: the electoral campaign is equal for all candidates. “The first round of the electoral campaign was fair for all competitors”, according to one of the registered candidates, Siarhei Haidukievich, the leader of the Liberal Democratic Party. In his view, all competitors could freely collect signatures. According to the coverage, giving free time to all candidates on the air both on state Channel 1 and the Belarusian National Radio 1 proves that they treat all candidates equally during the election campaign. Traditional Belarusian symbols used by pro-Lukashenka campaigners. “Belaya Rus”, a state-supported public association, has begun its pre-election agitation campaign for the incumbent head of state. According to coverage on Channel 1 the event’s attractions included Belarusian folk music and free bracelets with a traditional ornament. Belarusians also had the chance to leave their written requests to Lukashenka. Taciana Karatkievich. Journalists also reported on Tatsiana Karatkievich’s pre-election campaign in the town of Lahojsk, where her team distributed leaflets. They pointed out that Karatkievich directly spoke to people about her political programme. Who really cares about Belarusians? Channel 1 reports that three fourths of Belarusians trust Lukashenka. This is according to the results of a survey conducted in August by the information-analytical centre. Over 74% of people agreed that the politics of the incumbent president is supportive of ordinary people. According to over 77% of people, Belarus under Lukashenka is going in the right direction. Lukashenka as a remedy for the corruption and poverty in the early 1990s. Glavnyj Efir in an evening programme on Channel 1, launched a series of documentary movies on how the country has changed over the last 20 years. While speaking of the achievements they mainly emphasise the role of the current head of state, whereas failures are usually assigned either to internal opposition forces or external issues with Russia. Describing the years 1993-1994, reporters of Glavnyj Efir emphasised the major economic hardships of that time: empty shelves in stores, rising prices, destroyed collective farms, wild privatisation, poverty and mandatory vouchers for food. However, the solution to these difficulties arrived with Alexander Lukashenka stepping into power, as the journalists hinted. The incumbent head of state with his famous anti-corruption speech given in Parliament won Belarusians’ heart and proposed a new quality in politics, reporters emphasised. Who saved Belarusian independence. Describing the years 2002-2003, reporters mainly focused on the “construction” achievements including the National Library and the first underground shopping centre in Minsk, something that was unbelievable in the early 1990s. Reporters also pointed out that Lukashenka has done a lot to maintain the independence of Belarus by not allowing the country to be transformed to just another Russian region. Belarusian maidan. Commenting upon the protests following the 2007 presidential elections, journalists stated that “a political minority did not agree with the peoples’ will” which decisively supported Lukashenka. Participants of Dzielo pryncypa, a talk show hosted by Vadzim Hihin, discussed collecting signatures for the nomination of candidates for the presidential election. Among the participants on the talk show was an MP, an independent political analyst, and also the heads of all candidates’ electoral committees. The pre-election campaign is colourless? Valery Karbalevych, an independent political analyst, vocally criticised the authorities. He mainly argued that the pre-election campaign was boring and reflected the lack of real political life in the country. In his view, the vast majority of Belarusians remain indifferent towards the election. “The whole state machinery works in favour of just one candidate, the President”, Karbalevych openly said. The majority of the discussants strongly disagreed with him. “If you think that an interesting pre-election campaign is when the candidates are arguing, when there is blood spilt on the streets, and mass protests are taking place… we do not need such a campaign!”, replied Aleh Haidukievich, who is the head of Siarhei Haidukievich’s electoral team. Access to state media for all? Andrej Dzmitryjeu, the head of Taciana Karatkievich's electoral team, pointed out that the political debates in Belarus are taking place only during the pre-election campaign rather than as a part of the regular political process. He also noted that his organisation remained unknown to most of Belarusians as it had no access to state TV and radio. Not so voluntary support for Lukashenka? Karbalevich noted that people working in state enterprises were often forced to sign on to the support lists of Lukashenka. That roused some controversy in the studio. Conflict and democracy in the opposition? Karbalevych argued that the real political life in Belarus actually takes place amid the opposition, as people argue there which remains a part of a normal political reality.